I finally finished my box for the Cereal Killers book. 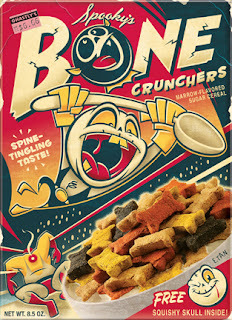 Fortunately, I found doggie treats that looked just like the cereal I had in mind. They even came in those funky colors that I had going in the rest of the design. We did a whole heck of a lot of food packaging projects when I was in art school but I never got to work on one since. Can't believe it took this long...and it's kind of a fake one. Why the hell did they make me take sooooo many food packaging classes?!?! Just kidding. They were fun and I'm sure that knowledge will kick in once I get to work on my dream project which is to design beer packaging! Speaking of beer, I think I'm gonna go get s#!+faced! Cheers! I only got into "art" cuz you can wear shorts to work (guess I could've been a lifeguard too, or the Crocodile Hunter). My real ambition was to invent crap. I truly believe that inventors are the unappreciated geniuses of our society. They don't just sit there content with the way things are. They're more like "F the b.s.! I'm gonna make life easier...for everyone." That's such a daunting task and it must take balls the size of watermelons to actually go through with. With that in mind, I decided to muster up what courage I have, screw the "art" thing for a while, reach for the sky and invent something. Call me crazy but I think we're all capable of inventing something pretty f-ing sweet. We just need watermelon balls. Here's my 1st attempt. I call it "The Turbonator Jr.!" Does anyone happen to know how to set up a paypal account?